One of the most notorious and long-standing by-catch issues has been in commercial tuna purse seine fisheries in the Eastern Tropical Pacific (ETP) ocean off Mexico and Central America. For unknown reasons, yellowfin tuna in the ETP commonly swim beneath herds of dolphins and other species such as whales and whale sharks as they migrate through the open oceans. Using floating nets in excess of 2,000 meters long, ETP tuna fishing fleets deliberately encircled dolphins, whales or sharks in order to catch the tuna below them. Since 1959, when the US tuna fleet introduced the practice, an estimated seven million dolphins in the ETP tuna fishery perished, of which about five million were from one species - the northern offshore spotted dolphin. Because the fishing fleets were not controlled, many dolphin populations had become severely reduced by the 1970s. Today, dolphin deaths in this fishery are declining because of an international agreement to bring the fleets under control, including a regulation that all tuna purse seine boats fishing in the ETP must carry professional observers. Much less is known about the numbers of dolphins and other animals captured and killed in the other purse seine tuna fisheries in the Pacific, Atlantic and Indian Oceans. This is because it is only in the eastern Pacific where the scientific observers are required on all commercial tuna vessels. Many populations of dolphins, sharks, whales, even endangered sea turtles could be threatened by purse seine fishing operations, but little remedial action can be taken as long as the companies of the global tuna industry are successful in keeping their impact secret. Countless birds and other animals suffer, and many die, from injuries caused by swallowing or becoming entangled in discarded fishing hooks, fishing line and lead weights. Even the most conscientious and careful fishers must share the blame, because every sport and recreational fisher eventually loses tackle - fishing line easily snaps when it becomes tangled in tree branches during casting or when hooks get snagged on rocks or logs in the water. And even the smallest amount of lost line can add up to a huge problem for animals. Fishing tackle can injure animals in a number of ways. Birds who fly into fishing line caught in trees become hopelessly entangled; most will slowly starve to death. Animals who get entangled in line that is on the ground can suffer a similar fate if it catches on rocks or debris. Unfortunately, the more animals struggle, the tighter monofilament line becomes - animals who don't die can suffer severed wings or feet. Other types of tackle can be deadly, too. Birds who swallow hooks can suffer lacerated beaks and throats, and animals can be poisoned by lead sinkers. 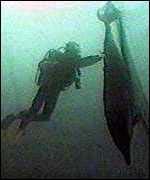 Purse seines are long walls of netting (up to 1 km long and 300 m deep) framed with floatline and leadline. They are used to encircle entire schools of fish at or near the surface. A drawstring cable is threaded through the bottom of the net. When the cable has pulled the netting tight, enclosing the fish in a pouch, the catch is hauled on board. The main negative impact of purse seines has been the incidental capture of dolphins, although modifications have been developed which allow dolphins to escape alive. When small pelagic (open sea) purse seines are used with attraction lights, there can be incidental by-catch of small fish, juveniles or endangered species. 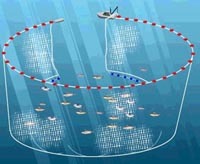 The increasingly used practice of encircling floating objects, including man-made fish aggregating devices (FADs), increases the capture of small sized and immature fish amassed around such devices. With nearly invisible filament mesh, enormous drift nets (used in the open ocean) catch and hold fish by the gills. When strung together, large-scale drift nets can sweep almost 60 km, catching everything in their path. During the peak years of driftnetting in the late 1980s, official estimates pointed to annual death tolls of tens of thousands of dolphins, whales and seals. Up to 750,000 seabirds, as well as millions of non-target fish and sharks were also caught and killed. At that time more than 50,000 kilometres of drift nets were being set in the Pacific Ocean each night. The by-catch problem was so dire that in December 1992 the United Nations banned large-scale driftnetting in international waters, prompted by widespread protest from governments and conservation groups around the world. Until then, no regulations existed to control this indiscriminate and destructive fishing technique. Smaller drift nets (<2.5 km in length) have been used since the ban. The United States still permits drift net fishing within US waters, and at March 2007 there were over 1300 vessels fishing with drift nets in European waters.